San Francisco voters may get the opportunity to rename their airport after slain politician and civil rights activist Harvey Milk. Will San Francisco name airport after slain gay icon Harvey Milk? (CNN) - "Boarding for Harvey Milk San Francisco International Airport." Civil rights activist Stuart Milk can imagine the impact of that airport announcement on the scared young people he's met in the United Arab Emirates and other countries around the world, where gay people live in fear for their lives. 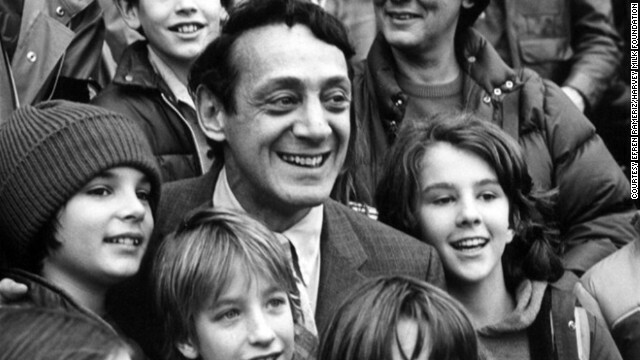 Stuart Milk's uncle Harvey Milk, a San Francisco supervisor, was one of the first openly gay politicians in the United States when he and San Francisco Mayor George Moscone were killed by former supervisor Dan White at City Hall in 1978. "San Francisco has 9 million international passengers and about 40 million passengers total passing through annually, and (this name change) sends an important message of societal change," said Stuart Milk, co-founder of the Harvey Milk Foundation. The name change could become a reality if a San Francisco lawmaker has his way. David Campos, an openly gay Latino member of the San Francisco Board of Supervisors, plans to introduce legislation Tuesday to make naming the city's airport after Milk possible. The supervisor sees the likelihood of U.S. Supreme Court rulings later this year on cases getting at "the core of whether or not members of the LGBT community will have equal treatment under the law" as a prime time to initiate the tribute to Milk. India is the world's largest producer and consumer of milk, yet neither exports nor imports milk. New Zealand, the European Union's 27 member states, Australia, and the United States are the world's largest exporters of milk and milk products. China and Russia are the world's largest importers of milk and milk products.`. :..